TNPSC WORLD | TNPSC LATEST STUDY MATERIALS: Department Exam December 2016 துறை தேர்விற்கான நுழைவு சீட்டு வெளியிடப்பட்டுள்ளது. 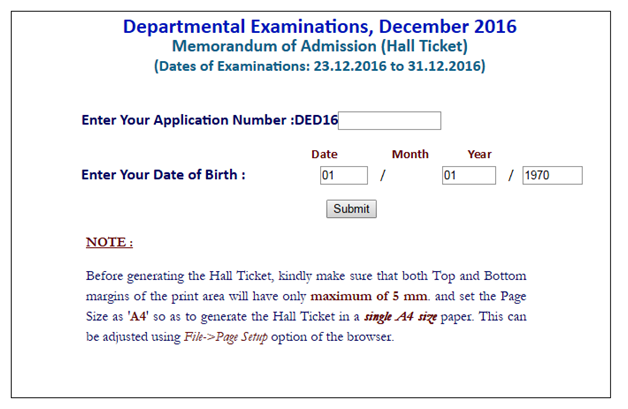 Department Exam December 2016 துறை தேர்விற்கான நுழைவு சீட்டு வெளியிடப்பட்டுள்ளது. 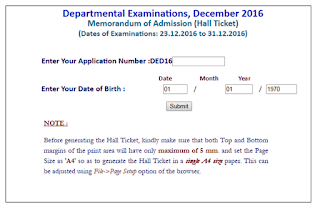 TNPSC - Departmental Examinations, December 2016 - Hall Ticket Published | Department Exam December 2016 துறை தேர்விற்கான நுழைவு சீட்டு வெளியிடப்பட்டுள்ளது. கீழ் கண்ட இணைப்பை பயன்படுத்தி பதிவிறக்கம் செய்து கொள்ளவும்.Departmental Examinations, December 2016 Memorandum of Admission (Hall Ticket) (Dates of Examinations: 23.12.2016 to 31.12.2016) Enter Your Application Number :DED16 Date Month Year Enter Your Date of Birth : 01 / 01 / 1970 Submit NOTE : Before generating the Hall Ticket, kindly make sure that both Top and Bottom margins of the print area will have only maximum of 5 mm. and set the Page Size as 'A4' so as to generate the Hall Ticket in a single A4 size paper. This can be adjusted using File->Page Setup option of the browser.